A small bag of straight fentanyl on display at the State Crime Lab at the Ohio Attorney General's headquarters of the Bureau of Criminal Investigation in 2015. Nebraska police say they seized 118 pounds of fentanyl in April. On Thursday, police said the Nebraska State Patrol's crime laboratory confirmed the substance was entirely fentanyl — making it the biggest bust in Nebraska's history, they said, and worth about $20 million. "When you take that much fentanyl off the street you are saving lives," Nebraska Gov. Pete Ricketts said Thursday. 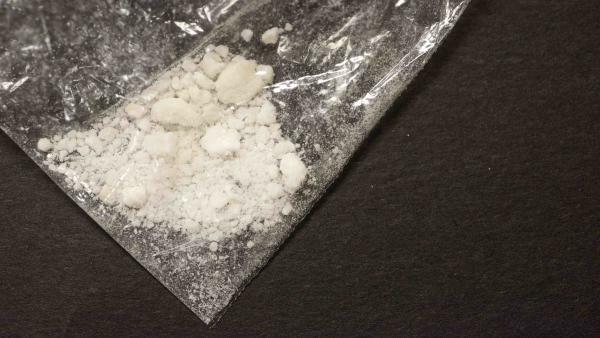 Fentanyl is a synthetic opioid 30-50 times more potent than heroin and 50-100 times more potent than morphine, according to the Drug Enforcement Administration. Two milligrams is enough to be a lethal dose for most people, the agency says. Troopers found the drugs after seeing a tractor-trailer driving on the shoulder of the interstate last month. A "trooper became suspicious of criminal activity" after stopping it and found a "false compartment" during a search of an empty trailer. The Nebraska State Patrol says the compartment contained 42 packages wrapped in foil. The driver, 46-year-old Felipe Genao-Minaya, and passenger Nelson Nunez, 52, were arrested "for possession of a controlled substance with intent to deliver and no Drug Tax stamp." Both are residents of New Jersey, according to authorities. Fentanyl has received increased attention in recent years as a contributor to the country's opioid crisis, which kills an average of 115 Americans each day, according to the Centers for Disease Control and Prevention. Last year the CDC said fentanyl was found in the bodies of the majority of people who died of opioid overdoses in 10 states during the second half of 2016. "Out of a total of 5,152 opioid overdose deaths, almost 3,000 tested positive for fentanyl, and over 700 tested positive for drugs that have similar chemical structures to fentanyl," the CDC said in October. U.S. Customs and Border Protection's Office of Field Operations says it seized 951 pounds of fentanyl in fiscal year 2017, more than double the year prior. Already, the agency says it's seized almost as much — 934 pounds — in just the first six months of the 2018 fiscal year. As NPR's Brian Naylor reported, much of that fentanyl is coming from overseas through the U.S. Postal Service, which handles 1.3 million packages coming into the country each day. The DEA blames China and Mexico as the "major source countries" where fentanyl is manufactured in labs. The drug is legal for certain cases of pain relief, but because of a high profit margin is often sold illegally, according to the agency.